A gorgeous mountain rental - three bedrooms, two baths, beautifully decorated home. A wonderful mountain retreat with total privacy. Top-of-the-line kitchen with all amenities including eating bar with stools. Living room/kitchen combination. Living room has soaring, vaulted, exposed, beamed ceilings and stacked stone fireplace. Wide pine-planked floors. Two guest bedrooms on main level (each bedroom has exterior door leading to private, covered, back porch). Generous-size guest bathroom on the main level. Master bedroom on second level with vaulted, beam ceilings. Master bath. Sitting room/alcove overlooking the living room. Sleeps up to six people. Two sets of atrium doors lead to the extra-large screened porch with wicker furniture and dining table (extra living area practically nine months out of the year). Huge winter views from front and back porch. Side entry deck with gas grill. Top of the line, stainless steel sink & appliances. Wonderful house with everything you need for a great weekend. This was the perfect place for three couples to get together and have fun. The beds are comfortable and the kitchen well equipped. The gas log fireplace made it cozy even though it was 26 degrees one night. The driveway is super steep so beware if there's a chance of ice. But once you get up there the views are beautiful. It's more of a warm weather place, since they have a huge screen porch where the main dining table is located. They do have a gate leg dining table that you can pull out inside but it's a tight squeeze. Overall we loved the place and had a great weekend. Lovely, secluded home within minutes of the interstate and Saluda. 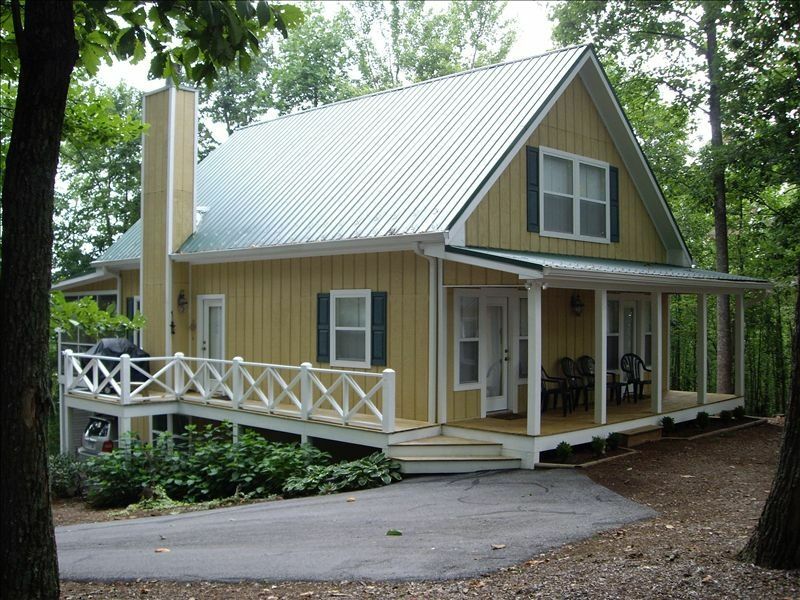 Perfect mountain setting, enjoy sunrise over the mountains from one porch and sunset over the mountains from the other porch! We absolutely loved the house. Every room was full of antiques and wonderful little decorating touches. The beds slept great and the quilts and bed linens were of a high quality. The screened in porch was awesome and served as an outdoor dining room as well as a great visiting area. We took the parkway from Brevard to Asheville, shopped in Black Mountain and Asheville,and also took in a show at the Flatrock Playhouse. This was our fourth or fifth time at the Playhouse and they always put on a great show.. All in all had a wonderful time. Looking forward to visiting again! The cottage was clean, secluded and up-to-date! Just the right amount of the homeowners loving family history scattered about .... instead of renters we felt like very special guests! Such a warm, welcoming home. The town of Saluda was very charming as well! Green River Adventures have the best whitewater guides we have ever encountered (after 25+ years of rafting)! We only wish we had more time at the perfectly appointed, serene mountaintop home! This place was perfect! Everything is maintained well and the decor is charming! The location was perfect for us because we got to go into the town of Saluda, do some great hiking and enjoy its beautiful privacy. If you cancel a confirmed reservation, regardless of reasons, and the house is not re-rented, you will forfeit your advance deposit of half the basic rental amount. If you paid in full and the unit does not re-rent, you will still only forfeit half the basic rental amount. All other money prepaid will be automatically refunded. If the house is re-rented, all money prepaid will be refunded. Upon receipt of final payment, a code and map will be mailed directly to you.